What does the stock market think about Donald Trump? Like many of you, I have watched the presidency of Donald Trump with a mixture of horror and amusement. In my case, these alternating emotions are not driven by my politics so much as the ongoing spectacle itself. It’s all drama and surprise. Nowhere is this more evident than in the stock market’s reaction to his presidency. Before the election, when the odds leaned heavily toward Hillary Clinton winning, the stock market appeared to be mortified by the possibility of a President Trump. Indices like the S&P 500 would shudder whenever the odds moved in Trump’s favour. The most dramatic such event, both in terms of the election odds and the consequent movement in stock prices, was the letter written to Congress from James Comey, the director of the CIA, notifying them that his agents had “learned of the existence of emails that appear to be pertinent to the investigation” regarding Clinton’s potentially illegal use of a private e-mail server while serving as Secretary of State. The letter was delivered on 28 October 2016, just 10 days before the election, and made a dramatic impact on the election. Prior to the letter, Clinton’s odds to win were well over 80 per cent, according to Nate Silver, the statistics guru who runs fivethirtyeight.com. The revelation in Comey’s letter dropped her odds down to 65 per cent before rebounding somewhat when Comey released a second letter on 6 November, this time informing Congress that no relevant information had been found. 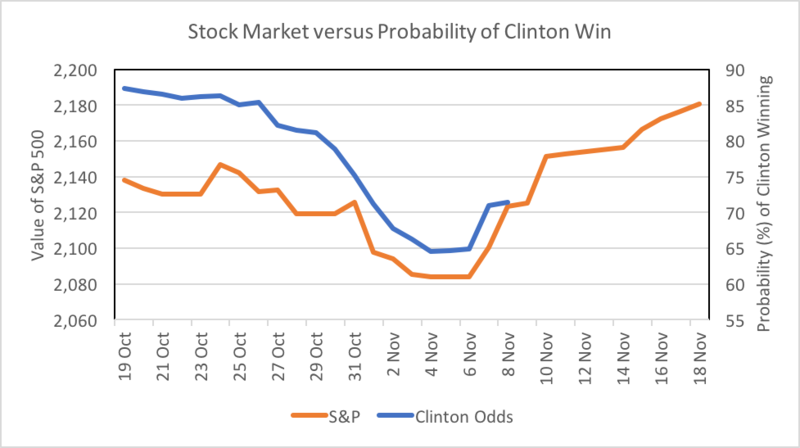 In the graph below, I’ve plotted Clinton’s odds of winning (in blue) and the value of the S&P 500 (in orange). Up until the election on 8 November, the two lines track each other quite well. The implication here is that the market perceived a Trump presidency to be bad for the economy. The narrative at the time was that Trump would be too erratic and too autarkic to be an effective president. What is fascinating about the Comey episode, particularly in hindsight, is the reaction of the stock market after Trump’s surprising win. It went up. And it has continued to go up. It is up 20 per cent since the election and reaching all-time highs. Virtually all of pre-election fears about a Trump presidency have been realised – he has been erratic and has promoted autarky – and the stock market hasn’t flinched. I'm very hopeful and optimistic on what it [the Trump presidency] means. The fears of protectionism, while valid, are greatly oversized relative to the benefits to the other parts of the economy. This economy is so over-regulated and people are just drowning in red tape, that the removal of that, and I'm expecting serious tax reform, cuts to the corporate tax rate. So I'm quite, quite optimistic on the economy. My personal interest in this phenomenon relates to the larger debate in finance regarding efficiency of markets. Market efficiency is generally interpreted two ways. The first interpretation says that if markets are efficient, prices in markets accurately reflect all available information. The second says that if markets are efficient, investors cannot make abnormal profits by trading on available information. Given the first interpretation, were markets inefficient if at one time they feared a Trump presidency but shortly thereafter came to embrace it? Maybe yes, maybe no, depending on whether you believe “accurately” requires investors’ beliefs to be consistent. What the Trump presidency has made clear is that the second interpretation of market efficiency is almost certainly true. Go back in time, back to mid-October 2016, and try to imagine how you’d invest based on the upcoming presidential election. To have made money, you would have needed to predict a) that Trump would win the presidency and b) that the stock market would celebrate that win. I’m not sure how many of you would have made that bet. Even in hindsight, it seems like a losing proposition to me. Given the limits of the office, presidents have rarely had much influence on stock prices. For better or worse, however, Donald Trump is no ordinary president. Time will tell whether the stock market was right about him. 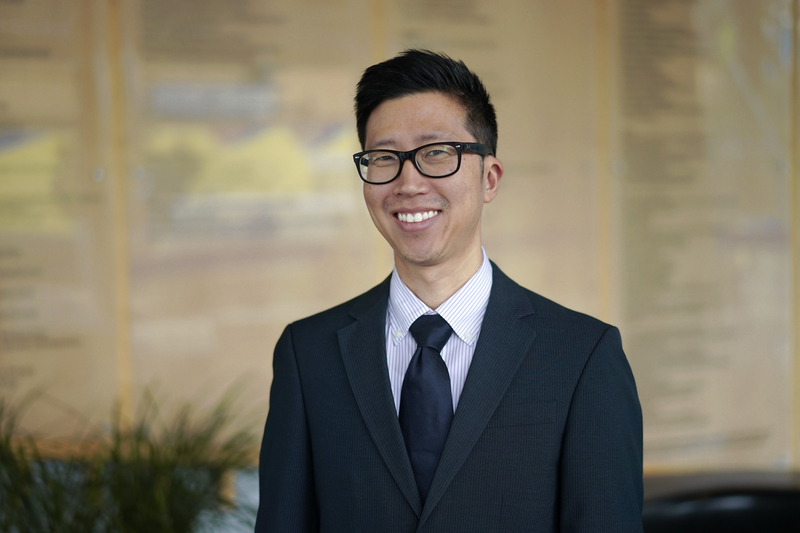 Dr Bryan Lim will be teaching 'Managerial Finance' for Melbourne Business School's online Graduate Certificate in Business starting in February 2018.